Home › News › Corinne’s Record Breaking Week! It’s been a good few days for Nova’s Corinne Mitchell. 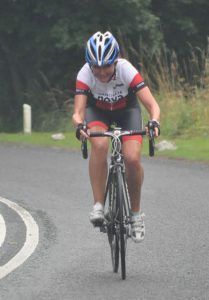 In event 3 of the Beech House Dental Practice TT league, a 12 mile lap of Kirby Hill-Dishforth-Ripon in cool and windy conditions, she broke the lady veteran course record with 30:13 to win ahead of Alison Sarmiento (31:48). In the men’s event it was the same podium for the third week running with Nova’s Duncan Mullier breaking the course record with 26:15 ahead of Prologue’s Dylan Flesher who broke the junior record with 27:22 but was pushed much closer by the drastically improving Rob Senior who was 14 seconds back. The Most Improved Rider event was won by Harry Wrightson for the second week running with 32:52 a massive improvement over the last year of 231 seconds! Corinne then broke Heather Thomson’s 16 year old ladies club record for a 25 mile time trial by 8 seconds at the South Pennine RC event in Derbyshire with 58:30. Alison Sarmiento improved her PB to 1:01:21. In the men’s event Duncan Mullier was just 13 seconds away from the club 25 record with 50:54. Report on Tom and Simon’s amazing Etape Du Dales ride to follow.